How to transfer iPad slideshow to computer and burn it to DVD? This article is about how to transfer a photo slideshow video from iPad to computer and burn an iPad slideshow to DVD on Windows and Mac. People can do many things with iPad, like watching movies, taking photos, listening to music. With iPad, you can take photos and then make a slideshow with your photos using slideshow app—Photo Slideshow Director HD. However, iPad can not burn a slideshow to DVD. So what is a free and easy way to transfer a slideshow to PC/Mac and burn the slideshow to DVD on computer? In the following article, I will show you the steps in detail. To make a photo slideshow, you can use Photo Slideshow Director HD. It is a professional and simple slideshow app for iPad , which can help you convert photos to a stunning slideshow with favorite music, dynamic transitions and pan&zoom, theme, text and more effects within minutes (Learn how to create a slideshow with it>>) .You can buy the app in iTunes App stores at $3.99. Before transferring, you need to save it to Camera Roll first. Tap “Export” icon and choose “Share Movie to Photo Library” , write the title and description, choose the resolution, and tap “Publish”. Now, the app begins to encode the video and save it to Camera Roll. To transfer the slideshow to computer, you have two ways for choosing: 1. 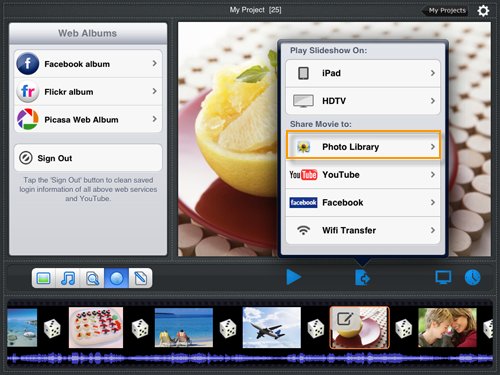 Transfer slideshow video with iTunes’ File Sharing function. 2. Move slideshow to computer with Photo Slideshow Director HD’s built-in WiFi Transfer. Also you can use Drop Box to store your slideshow in cloud server first, then download it to your computer. Here I will only show you in two ways. Connect the iPad to your computer with data cable. Open iTunes on your computer, click iPad name under the “DEVICES” list in the left side of the screen. Then you can see a row of Synchronous contents buttons in the upper part of iTunes Screen, click the third icon “App” icon . Scroll down ,then you will see File Sharing section. 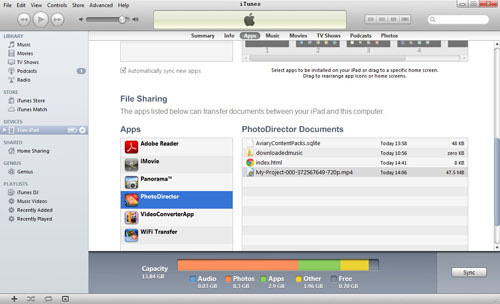 Choose “Photo Director” from the apps list, find the slideshow video you want to transfer in right column “Photo Director Documents”, then drag it to your computer desktop or a specific folder. After creating a slideshow with Photo Slideshow Director HD , you can share the slideshow to computer(both PC and Mac) with its built-in WiFi Transfer. Enter the URL address into your computer browser address bar. Then you can see the slideshow video list on the browser screen. Click the project name to download it to your computer hard drive. After transferring the slideshow to your computer, now you can burn the slideshow to DVD for watching latter or playing on TV or DVD player. Regarding burning videos to DVD, Windows DVD Maker is a first choice beyond doubt. On Mac, you can use iDVD . 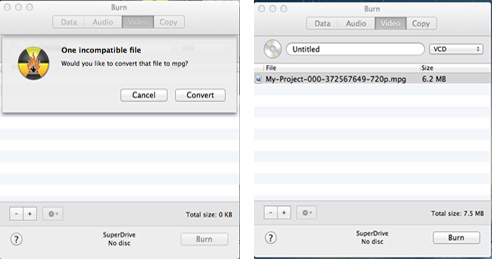 However, if your Mac has a new operation system of 10.7 or 10.8 without iDVD, you can use free burner app Burn. 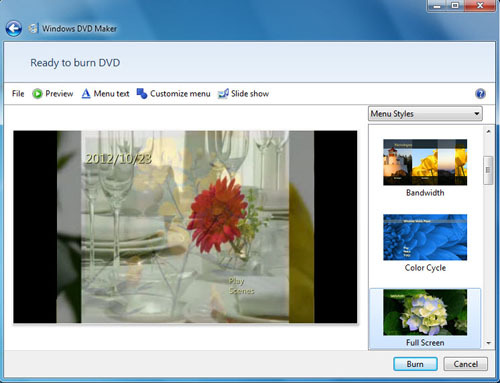 Windows DVD Maker is a free DVD burner for windows. Because Widows DVD Maker does not support mp4 and mov format (Photo Slideshow Director HD exports mp4 and mov slideshow video formats. ), So you need to convert your mp4 or mov video to avi first. 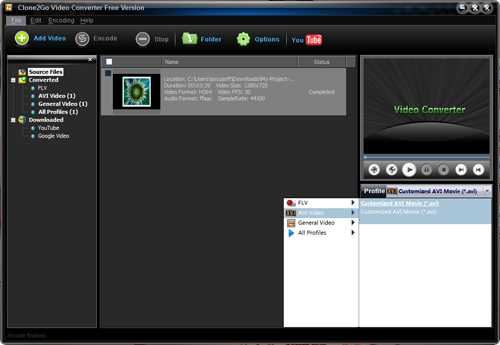 You can use Clone2go Video Converter Free Version to convert the video and choose output format as as avi. Insert a blank DVD into your computer drive. Then click Start-All Programs->Windows DVD Maker, then drag the avi video to Windows DVD Maker. Click “Next” to customize DVD menu and preview video. After that, Click “Burn” to begin creating the DVD. iDVD was no longer preinstalled on Macs shipping with OS X 10.7 Lion, and was not available on the Mac App Store with all of the other iLife apps. So if you have a new Mac with 10.7 lion or 10.8 Mountain Lion, you can use another free app Burn. You can also burn a DVD with iDVD on a old Mac operation system.Here, I will show you how to use app Burn to create a DVD on Mac. First go to its website, download and install it on your Mac. Then open it and import the slideshow video to the app. If your video is not mpg format, it will remind you to convert your video to mpg video which can be compatible with the software. Once you click “Convert” , it will automatically convert the video to mpg format. After that, you will see the video list . It allows you to name the DVD title and choose a disc type from VCD, DVD and DivX discs, then click “Burn” . You can see the rate of progress from the progress bar. After the DVD burning is finished, you can play the slideshow on computer and DVD player. Also you can watch it on HDTV.